This entry was posted on December 13, 2012 by Jessica Anderson. As part of our year end recognition, we award a “Product of the Year” to one of our best-selling, most outstanding awards we offer. The 2012 winner is our “Monster” line of trophies by Continental Awards & Trophies. Our 2012 Product of the Year - Monster Trophies by Continental. 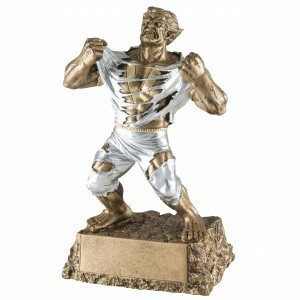 This is one of our most popular trophies, with a 5-Star rating and tons of Facebook likes! What makes these trophies exceptional? First, they're different - very different. They’re also well made, durable, and versatile. They are really fun and are a hit with most people with a Y-chromosome; guys love them, both young and old. So what kind of monsters do we have? We carry Hunky Soccer Monsters , Fierce Lacrosse Monsters , Buff Basketball Monsters , Ripped Baseball Monsters , Victorious Hulk Monsters , and Macho Martial Arts Monsters . Thank you Continental Awards & Trophies for offering this fantastic line of trophies to us! We are grateful to all of our suppliers for their terrific products – if it wasn’t for them, we wouldn’t be in business!